Our wineries are located in Galicia, in the northwest of Spain, surrounded by vineyards, green landscapes and the river Miño as a faithful companion, which invites us to meet this beautiful land while tasting a wine from Valei. This region is famous for its culture, ancient traditions and its wide and rich gastronomy, highly appreciated worldwide. Galician people are known to be adventurous and this is reflected in the daily international success of Galician products and companies. The Atlantic climate, of high humidity and mild temperatures, with precipitations of 1,300 mm per year and an average insolation of 2,200 hours of clear sunny days, create a microclimate for our vineyards, always obtaining an optimal degree of ripening for our grapes. Alvariño grape is the main production variety for our elegant wines. This mythical Galician variety has small and sweet grapes and makes our wines aromatic and glutinous. The bouquets are fruity and varied and in many occasions remind of ripe fruit. Its growing, transmitted from parents to children throughout several generations, is the perfect excuse to bring together relatives and friends to the wine harvest feast. This Denomination of Origin expresses the geographical area for the cultivation of the mythical variety which generates our unmistakable Albariño wine. Condado do Tea, an area with a microclimate especially suited for growing vines, characterized by its soft temperatures and Atlantic climate, allows to always achieving an optimal level of ripeness. 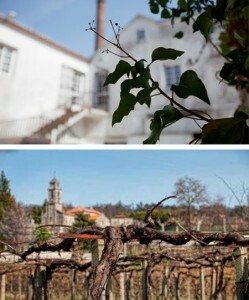 The Regulatory Council of the ‘Denomination of Origin RíasBaixas’ subjects its wines to strict controls which partly justify their high quality. 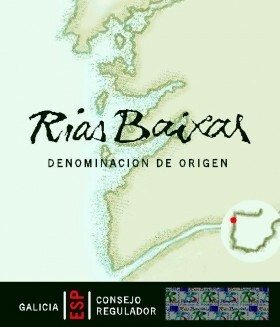 Only wines which pass this test are allowed to display the label “Denomination of Origin RíasBaixas”. Mencía grapes produce high-quality wines, especially in short aging periods, to keep the freshness and minerals of the Galician terroir from which they come. Historical variety, considered as one of the oldest introduced in the Iberian Peninsula. Mainly grown in small productions in the Galician areas of Lugo and Ourense, included in several Denominations of Origin, such as Valdeorras and Ribeira Sacra. We find clean and bright, cherry-color aromatic and fruity wines. Pleasant scent and mild in mouth, with balanced acidity, powerful in alcohol and tannic. Tasty, sometimes fleshy and slightly binding. Elegant aftertaste, with red berries touches and prolonged persistence. Native from Galicia, of high quality and aromatic power. It is the base for the white wines produces in the D.O. Valdeorras and Monterrei, providing quality to the coupages in the D.O. Ribeiro. With very small clusters, they produce wines with a marked floral and fruity aroma, with a great palate and overall balanced. It is currently one of the Galician varieties with greatest prospects, given its growing demand and international renown. White wines are made from the mythical Godello variety. Yellow-straw colored, with marked and intense bouquets that remind of white flowers and apple. Well-structured in palate, with natural acidity that makes them fresh and elegant. Red wines are made with the Mencía variety. Medium-depth perfect ruby color, with a bouquet of ripe red berries, such as redcurrant, raspberry and mulberry. Mild, fleshi and lasting palate. Galician Denomination of Origin located in the northwestern region of the province of Ourense, bathed by rivers Miño, Arnoia and Avia. It has approximately 2800 hectares of vineyards with heights between 70 and 450 meters, sometimes on pronounced hillsides with terraces called “socalcos”. The climate provides a mixed Oceanic-Mediterranean ecosystem, so it is humid and with average annual mild temperatures of 14-15ºC. Grapes ripen correctly, keeping the aroma and acidity that characterize these wines. Soils are mainly granitic, with high presence of gravel, which improve the edaphologic structure. They represent more than 85% of wines produced within the D.O. Ribeiro, mainly through the coupage of indigenous varieties (treixadura, loureira, albariño, palomino and godello), adapted throughout he centuries to the specific characteristics of the Galician soil, where they come from. 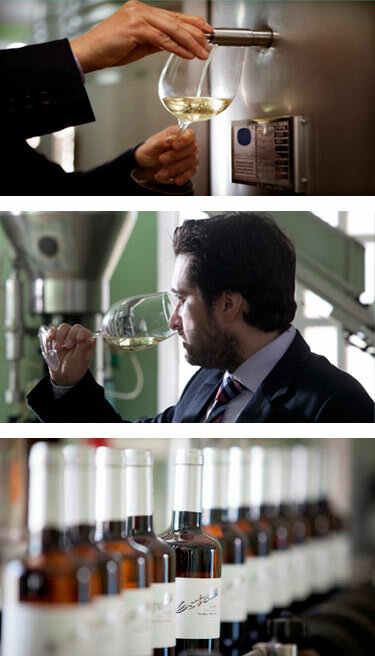 A good example is our elegant and complex Ribeiro Duque de Valei. It has an eloquent fruity, floral and balsamic bouquet that invites us to taste it with fish, seafood and appetizers. We produce wines from grapes coming from our own vineyards, as well as from the best yards of winemakers selected by our oenological technical team. Our vineyards are planted over granite pergolas called ‘parrales’ (vine arbors), aiming to protect them from humidity and to provide them with more substance thanks to sunlight in summer. Our dedication starts from the land itself and the selection of the grape. Thus, we perform strict monitoring controls which let us know the most suitable moment for ripeness and harvest. Thanks to the field controls and the careful manual harvest, the best grapes are delivered to our facilities as fast as possible, to prevent undesired oxidation and guarantee the optimization of grape juice. We use the latest technology for production, but we always respect the traditional processes from the old times. Our procedures are therefore less aggressive towards wine and more natural, thus keeping away from industrial processes while approaching the most ecological procedures. Currently, the prestigious oenologist Felicísimo Pereira, who has over 20-year experience within the viticulture sector, is in charge of controlling and supervising our so-called ‘de la cepa a la copa’ (from the vine to the glass) procedure. He always works together with the great human team that makes up our Winery.